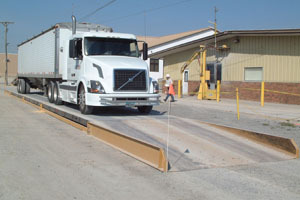 The contractor’s choice for temporary job sites, the FT2-PV portable vehicle truck scales can be installed on a compacted stone foundation and used for everything from individual axle weights all the way up to full sized semi trucks with trailer. Stone approaches can be utilized simply by piling it up directly against the provided steel bulkheads. Steel ramps are optionally available and are useful when installing the scale in an asphalted area where stone would not be desirable. 35 ton CLC "Standard Duty"
50 ton CLC "Heavy Duty - Off-Road Rated"
To request a 50 ton CLC scale, call us at 800-637-3326.